Twenty years after first seeing the Coen Brothers' debut feature, "Blood Simple," Chinese director Yimou Zhang couldn't get the film out of his head. So he decided to remake it as "A Woman, a Gun and a Noodle Shop," set a couple of centuries back in a small desert town in China. Were it not for some overly slapstick-y humor, it would totally work. Wang is the cruel and abusive owner of a noodle shop who learns that his wife has bought a gun from a Persian arms dealer. When he finds out that his wife is sleeping with Li, one of his employees, he decides to get the drop on them both. He hires Zhang, the best cop in all the land, to kill them. In the meantime, two other shop employees, Zhao and Chen, are conspiring to liberate from Wang's safe the back wages they are owed. What follows is an epic game of chess with all the players only able to see a small slice of the board. One after another they try to out think one another, only to end up in a deeper mess. It's a nice little metaphor for the rat race we all find ourselves in. Unfortunately, much of the suspense that's been so carefully crafted is regularly hamstrung by the overly broad humor, with folks stumbling, howling, cowering, stammering, quaking -- particularly Xiao Shenyang and Cheng Ye, who play Li and Zhao respectively -- most of it isn't funny and much of it is dumb. But to be fair, the blame for their performances rests squarely with director Zhang Yimou, who was clearly asking for this flavor of acting. There's plenty of room for humor in a good noir, "Blood Simple" itself being an excellent example, but packing the corners of a thriller with an episode of "The Three Stooges" just isn't going to work. That said, there is some fine acting in "Noodle Shop." Sun Honglei as Zhang is a soulless laser beam with a single-minded focus. Easily the smartest and most determined of the bunch, even he falls victim to the pitfalls of fear and greed. 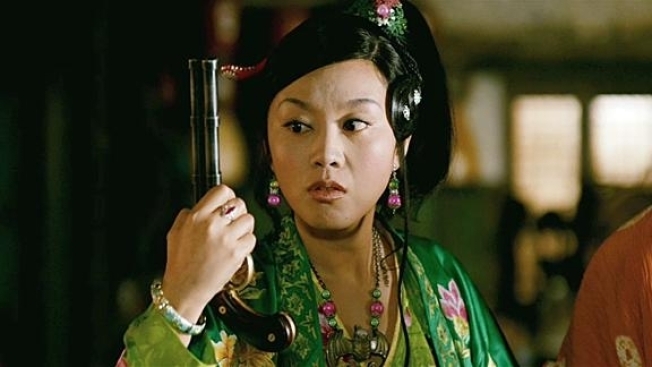 And Ni Yan as Wang's wife is great, running the gamut from rage to sorrow to contempt to terror. Setting aside his curious acting choices, director Zhang Yimou has shot a beautiful film, with rich desert landscapes, rolling cloud banks, and beautiful blues, grays and oranges. And there are a couple of sequences that one would gladly watch on a loop, like an early scene when Li, Zhao and Chen prepare a cauldron of noodles for the local police -- it's both stunning and mouthwatering. Zhang Yimou deserves credit for keeping "A Woman, a Gun and a Noodle Shop" true to "Blood Simple" while making the story very much his own. It's not entirely without its charms, but it falls a bit short of success.